The man suspected of planting explosives in New York and New Jersey had a notebook on him when he was taken into custody that detailed his Islamic extremist ideology. 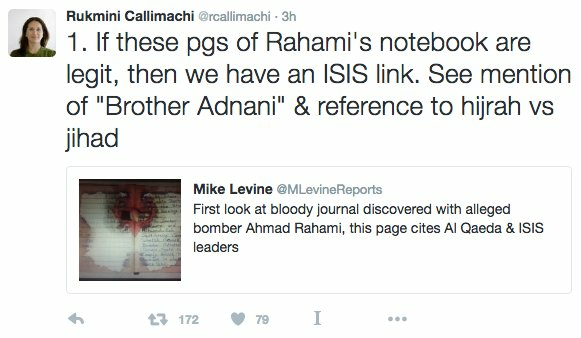 The notebook mentioned Abu Mohammad al-Adnani, who was the spokesman for the terrorist group ISIS until he died last month, according to ABC News. It also praised Anwar al-Awlaki, a notorious preacher and Al Qaeda recruiter, Osama bin Laden, the founder of Al Qaeda, and Nidal Hasan, who killed 13 people in a 2009 shooting at Ft. Hood, Texas. Police in Linden, New Jersey, apprehended 28-year-old Ahmad Khan Rahami after a shootout late Monday morning. He is suspected of being involved in three incidents throughout the weekend — a bombing along the route of a New Jersey charity race Saturday morning, a bombing Saturday night in New York City that injured 29 people, and the planting of additional devices in Elizabeth, New Jersey, on Sunday night. Prosecutors have filed charges against him in connection with the bombings. Authorities allege he spent months planning the attacks. 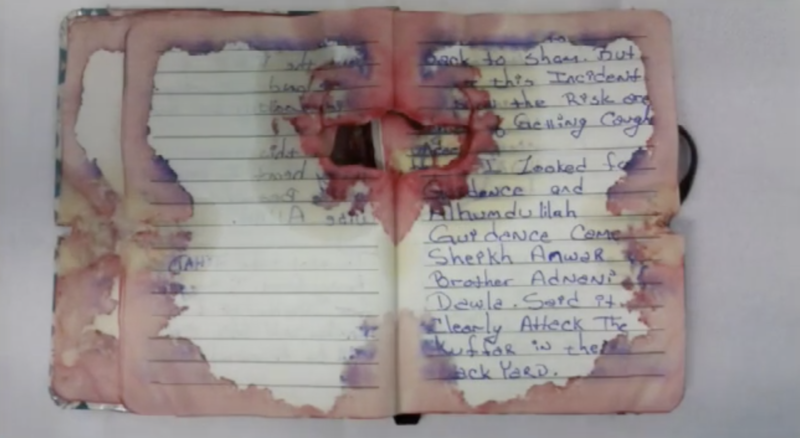 Rahami criticized the wars in Iraq and Afghanistan and wrote in his notebook about "killing the kuffar," or unbelievers, according to a criminal complaint filed Tuesday. "You (USA Government) continue your ... slaught[er] against the mujahidean [sic] be it Afghanistan, Iraq, Sham [Syria], Palestine," read writings in the notebook recovered by authorities. The suspected bomber also expressed concern about getting caught. According to the complaint, Rahami wrote, "The F.B.I. & homeland security ... looking for me." "My heart I pray to the beautiful wise ALLAH," he added, according to the complaint. "To not take JIHAD away from. I beg." Rahami even implied that he thought he might die while carrying out the attacks. "I beg ... shahadat [martyrdom] & Inshallah [God willing] this call will be A[n]swered," he wrote in his notebook, according to the complaint. Rahami made an apparent reference to a race, writing, according to the complaint, "In the streets they plan to run a mile." He also referenced pipe bombs and pressure cooker bombs, both of which were found in New York and New Jersey. At the end of the notebook, he wrote, according to the complaint: "Inshallah [God willing] the sounds of the bombs will be heard in the streets. Gun shots to your police. Death To Your OPPRESSION." It's unclear whether Rahami formally pledged allegiance to ISIS leader Abu Bakr al-Baghdadi, which the group instructs its followers to do to claim attacks. Authorities have not publicized any conclusive links between Rahami and global terror groups. It's possible that the bombings were inspired, rather than directed, by a group like ISIS or Al Qaeda. Rahami traveled to Pakistan in the years before the bombings, and his father had previously raised concerns with the authorities about his potential involvement in terrorism.